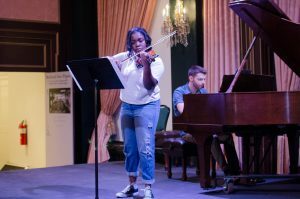 This excerpt was taken from Akili Farrow’s on-air segment on NPR’s From the Top Show 359 from Kennett Square, PA.
Akili, the Brahms is so beautiful and such an intense and dramatic piece of music that ends in this grand manner. How do you bring it to life? How do you bring out the drama? I used to take lessons with Kimberly Fisher. The second class she brought in an actress who taught us different acting techniques. The idea was for us to bring out our inner actor. Teaching us how to use our inner thoughts helped me bring out the drama in the piece. You’re the product of an outstanding youth music program in Philadelphia. Can you tell us more about that? I am an alum of the Play On, Philly! program. Play On, Philly! originated from the El Sistema program. Mr. Stanford Thomas brought it to our school, the Saint Francis de Sales School. This school is an elementary school, it has grades K through 8. Every afternoon from 2:30 to 5:30 we would have different classes. We each picked our own instruments and I picked the violin. Then we’d have lessons, group lessons, theory classes and orchestra rehearsals. You have some really exciting news we have to share. Tell us where you’ll be going to school this fall and how you ended up going there! This fall I’ll be attending the Royal College of Music in London. My aunt lives in London, which gave me the idea to think outside of the box about where I wanted to study. I took a couple lessons at the school and found a teacher I really connected with. Isn’t there someone else who introduced you to British culture? When I was younger and still now I was really into Ed Sheeran! You had something special you wanted to let the world know, right? I wanted to thank all of the programs that I’ve been in. First off I wanted to thank the Play On, Philly! program, the Musicopia program, the Philadelphia Symphonia, the Philadelphia Youth Orchestra, the All City Orchestra, the Primavera Fund, the All City Fellowship and my teachers Jennifer Lee, Kimberly Fischer, and Naomi Gonzalez. They say it takes a village, and you’re no exception. How wonderful to have so many inspiring people in your life! We have to also mention your parents. Not only are they sending you off to college, but they’re sending you off to the Royal College of Music. In London! We spoke to your mom, Ravonna, about what it’s going to be like to leave you behind. Ravonna Farrow: I try not to think about saying goodbye. When thinking about it my eyes get teary, my heart gets weak. She’s been away to summer camps. But those are just six weeks and I’m talking about four years. I’m afraid that it’s just going to break me down. I try to always be as strong as I can for Akili so that she doesn’t see me my weak points, but this is a time that she’s going to see it. 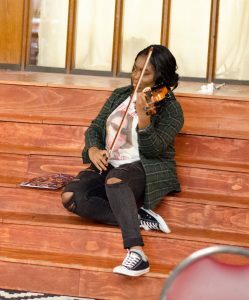 The thing I will miss most about Akili in the house is hearing the violin. The violin is part of our family, it’s something that we hear every day. Every minute of the day. Growing up in the Caribbean my parents always taught me that family always needs to be together and not apart. Akili not being there will make the house very lonely. We’d be lying if our eyes were dry right now… they’re not. Akili, any last minute thoughts to help your parents get through this? First I want to say thank you. And then I want to say not to worry. You all have taught me well and raised me well so you have nothing to worry about. Thank you. Listen to the interview and performance below. Every performer featured on From the Top returns home with a transformative experience at no cost to them or their families. To make a tax-deductible donation, please click the button below. Thank you!